The TE School District’s Education Committee meeting included a surprising (and expensive) item on the agenda – the proposal to outfit all teachers and grade 7-12 students with District issued laptops. A few short weeks ago, the school board approved a preliminary budget which included a 4.3% tax increase. With that unanimous vote, the Board assured the residents that expenses would be thoroughly reviewed ‘line by line’ in the coming months. And then we learn this week that this same board is discussing spending an estimated $1.8 million on teacher and student laptops. Where’s the fiscal responsibility? Setting aside the expense of the laptops, is there research indicating this is a current school district need? Don’t the majority of the teachers and students in the District already have computers? If a need for a computer exists with any of the students, it certainly should be met but has anyone polled the students/parents? 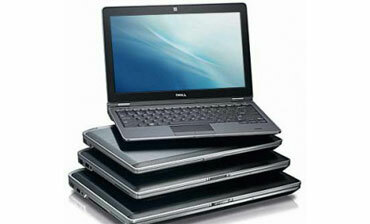 What level of laptops are proposed? My guess is that many of our students and teachers already own a higher quality of computers than the District is proposing. And what about liability issues that could arise with giving our students computers? Remember the Lower Merion scandal and subsequent lawsuit over district-supplied computers and the webcam spying on students. How will TE parents know that their children are protected from something similar? No one wants to believe that these things could happen in TE, but has the school board thought about security measures to protect the privacy of the students. The administration would like to buy a laptop for every teacher and student in grades 7-12 in what is commonly called one-to-one laptop program. They would roll it out over a three years. Each laptop would cost about $400 and they would purchase a 4 year warranty and accidental damage protection for $200 for a total cost of $600. As each laptop will cost around $600 ($400 + $200) and there are almost 3,000 students and teachers in grades 7-12, you are talking of a roll-out cost of around $1.8 million ($600 x 3,000). After the initial roll-out, I estimate would be an ongoing cost of around $450,000 ($1.8 every 4 years). These costs do not include software nor administrative overhead costs. I find it disappointing that the education committee voted to proceed with this project right after the school board voted to approve a preliminary budget that increases our taxes 4.3% while still showing a projected deficit of $468,118. I was a teacher for a decade. I taught grades 7-12. I taught math, science, and computer science. With the obvious exception of computer science, I never felt the need for the students to have computers every day. I believe that teachers should have smart boards and laptops and should have access to either laptop carts or computer labs on those days when computers would be helpful. I also support the Office 365 initiative as it allowed all students to have access to the same software so that documents can be exchanged with fellow students and teachers as well as allowing shared documents. I cannot however, support this abuse of taxpayer money when there is so much financial uncertainty and after so many massive tax increases over the past decade that show no sign of slowing down. 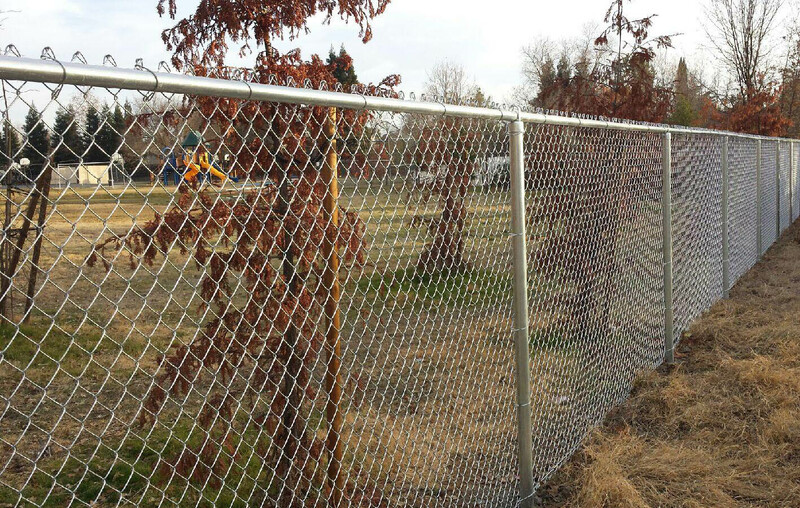 Contrary to what you may have heard … No compromise reached on planned Valley Forge Middle School fencing! As we learned at Monday night Tredyffrin Township Board of Supervisor meeting there seems to be some c onfusion and/or misunderstanding surrounding TE School District’s planned fencing project at Valley Forge Middle School. Some members of the school board have suggested that the issue was settled with the Green Hills homeowners and Chesterbrook Civic Association and compromise reached. We learned at the supervisors meeting, that the township solicitor Vince Donohue (and apparently the supervisors), had heard the same inaccurate rumor. Other than a statement by TESD President Kris Graham read to a handful of people at the Facilities Meeting on Friday, April 10, 2 PM, there has been no communication whatsoever between the school district and the Valley Forge Middle School neighbors regarding the fencing. But somehow, the school board president’s statement was translated by the school board as an agreement and circulated to the public. Negotiation is a discussion between both parties trying to work on a solution. It doesn’t work when you only have one party at the table. During the public comment period at the supervisors meeting, Green Hills resident and president of the Chesterbrook Civic Association David Miller, read the following prepared statement which offers historical background. I think its important for people to understand that the VFMS fencing issue is unique and differs from the other TESD fencing projects. 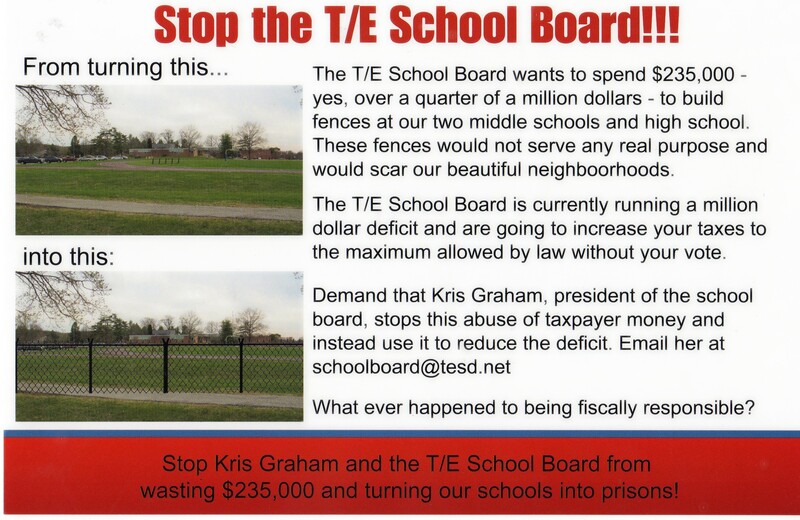 Although the fencing project will probably not be listed on the agenda for the TESD school board meeting, on Monday, April 27 (7:30 PM at Conestoga High School), I strongly urge the Green Hills residents to attend and voice their concerns and opposition. Good evening my name is David Miller, I am President of the Chesterbrook Civic Association and a resident of Green Hills in Chesterbrook; I’ve lived in the township for over 20 years. The Chesterbrook Civic Association has a legal agreement with the TESD concerning development around VFMS. This agreement was reached and documented with the township’s assistance through the special exception granted by the zoning hearing board when the 4 athletic fields adjacent to VFMS were developed in 2002/3. At the April 10th Facilities Committee meeting we think the TESD presented plans that will violate this agreement. I say we “think” because nothing is in writing and the fact that the VFMS fence was going to be discussed was only added to the agenda 2 hours before the Facilities Committee Meeting which was held at 2:00 on a Friday. So, as you would expect, it was difficult to getting people there at the last minute. We think their plan is to build a fence along the northern border of the original Middle School lot and along Valley forge Road to the border with Green Hills and then along the border with Green Hills to the first residents property line. So why should you care – This is not just a dispute between neighbors. This is issue impacts the entire community. 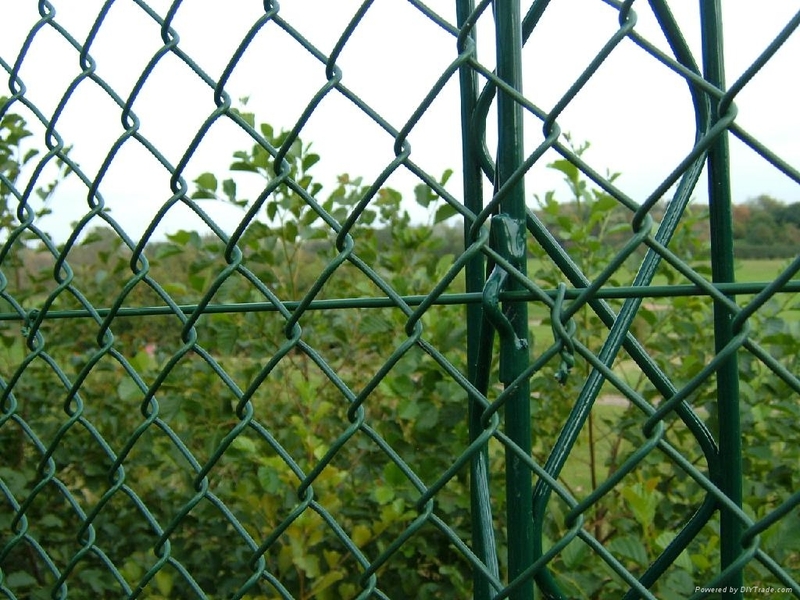 If the TESD builds the fence as we think they are planning, it will negatively impact all of Chesterbrook, cost the township money and is inconsistent with the Chesterbrook master plan. In 2002 the TESD presented a plan to build 5 fields and a parking lot on the RC zoned lot between VFMS and Chesterbrook. This plan had many significant issues and could not be built as presented. But more importantly at this time the township was developing Wilson Park and there was some view that the school district should provide fields for students and the township should provide fields for the sports leagues. From the residents perspective it’s the same kids in different uniforms. After discussion the township formed a committee consisting of members of the township staff, planning commission, school board and residents to work out a plan. Which we did and which was built and documented. The legal agreement between the CCA and TESD, documented during the Zoning Hearing Board’s Public Hearing when the special exception was granted is the result of this process. Let me read some highlights from 2002. We do not know the school board’s view on this agreement, they will not return my calls or emails and have directed their attorney not to work with our attorney. But based on the last Facilities Committee Meeting we do know they moved the fence 600 feet away from the residents after receiving letters from our attorneys. So maybe they are starting to take this seriously. The fence will block community access to the playing fields. In 2002 the planning commission required the TESD to add parking to the VFMS lot to accommodate people who would be using the 4 new fields. This fence will block the path from the parking to the fields. People will either have to park on Chesterbrook Boulevard or the township will have to provide alternate sites for the sports teams. How are you going to pay for 4 new multipurpose fields? The TESD has made it very clear we should expect the gates to be locked except when students are going to and from school. The walking paths will be blocked so residents can’t walk to Gateway, Wilson Park and St. Isaacs. These paths are part of the original Chesterbrook Master Plan. Again, back in 2002 the TESD was required to rebuild the walking path so residents could pass by the school … why would you let them block these paths now? If there isn’t an alternate route for residents to get around VFMS they will walk on school property. The school board has said they will direct the schools to call the police when unauthorized people are on school property, so are they really going to call the police when some resident is walking to Wilson Park or St. Isaacs? Why would we create this issue? Police time is valuable and there is at least one easy fix, just build a short connector path behind the football field between the exiting sidewalk and the existing walking path. We think their plan calls for a fence to nowhere in the woods. Besides being silly since it will be parallel to an existing fence around the field closest to VF road, so that they are just fencing in the trees, it violates the provision that calls for the woods to be undisturbed. Finally, we believed the school board’s attorney when he said “the district will be legally bound” and “any material change in that plan we understand we have to come back before this board”… there has to be some integrity a process sanctioned by the Supervisors back in 2002. So we would like you to tell the TESD to honor their commitment from 2002 and then implement the same process we used last time by creating a group consisting of residents, staff and officials to resolve this quickly and reasonably. We are parents and are not against student safety we just want a plan that makes sense. Fencing at Valley Forge Middle School is on the move: Plan now includes a “Zig Zag Fence to No Where”. The TESD Facilities Committee meeting was held on Friday, April 10 at 2 PM. 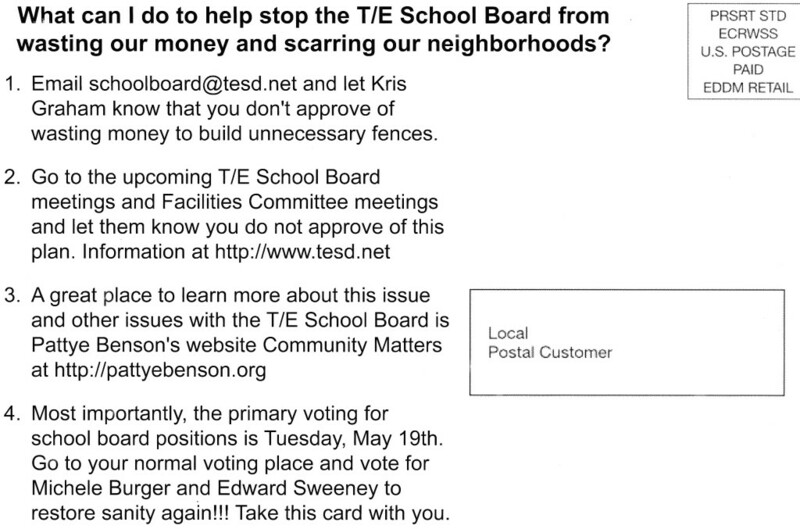 Although the agenda was available on the TESD website for a week, there was no mention of the Valley Forge Middle School fencing project. With the ongoing fencing discussions with the District, township and residents, it was odd that there was to be no discussion of the matter. When we showed up for the meeting, we were surprised to learn that the VFMS fencing project was added to the agenda. No one was notified of the last minute addition – not even the adjacent Green Hills property owners most affected, the “abutters”. When I asked about the last minute change in the agenda and lack of notification, Facilities Chair Pete Motel referred my question to Art McDonnell for the “policy” answer. According to McDonnell, the Board can change the agenda has much as they want and anytime they want – that’s the policy. McDonnell added that the District was not sure if they would have a statement on the fencing (and apparently only decided minutes before the start of the meeting!). Interesting that with 7 of the 9 school board members and Supt. Dan Waters all in attendance at the Facilities Meeting that it is the Business Manager who describes the District’s policy. Why do we need to pay for a Superintendent (and we currently have two – Drs. Waters and Gusick) or elect a School Board, when we have a Business Manager making so many of the District’s decisions? The Facilities Committee met on Friday April 10 and offered a counter proposal for the VFMS fencing project. As an affected homeowner, I was pleased to see at least some concessions made, but, in reality, I think there is much left to be desired in the new proposal. -no fencing in front of abutting homes; Instead, 6 foot chain link following green line plan on upper fields. 4 foot fencing running down VF Rd extending to northern border woods. 4 foot fencing extending into woods at northern border, zig zagging through trees, ending at a residents outer property line, well within view of their home. “enhanced signage” at locations TBD on or near the school borders. Facilities Committee will meet with Abutting households at date TBD to get input on these signs. -nothing in writing or indication that the 2002 agreement between CCA and TESD would be amended to reflect the new TESD proposal. -A connector path is not being planned on the upper field after the rest room kiosk that allows easy pedestrian access to the sidewalk along VF Rd. The Facilities Committee chairman has repeatedly said that they “reserve the right” to lock the gates at some point in the future during school hours. I think this locking will be done sooner than later without a new accommodation, which is what the new connector path (approx. 80 yards long by 4 foot wide) will provide. -under the revised plan, the woods will definitely not be “Undisturbed” as expressly promised in the 2002 agreement … so this would be a violation of the agreement, unless an addendum to the Special Exception is agreed upon. In my opinion, Tredyffrin Township needs to realize that what is being proposed is far from a satisfactory outcome for the residents of Green Hills and Chesterbrook. The Township needs to actively intervene and disallow any potential violation of the 2002 Special Exception. It’s imperative that as many residents as possible go to the Tredyffrin Townships Supervisors meeting on April 20th to express the position to them that the School District has to honor the 2002 agreement. Again, this requires the School District to get in in front of the Zoning Hearing Board to get an amendment to the 2002 Special Exception agreement that my homeowners associations can agree to. Until such agreement is reached, this is still an active issue. Please encourage anyone else in Chesterbrook that you know to attend as well … it isn’t just a Green Hills issue; it’s an issue for all the residents. Did the School Board actually think that the concession stated to a handful of people at a Facilities Committee meeting to move the fence was somehow going to end the debate? The Facilities Chair Pete Motel continues to state and re-state that the District does not have to go before the township’s Zoning Hearing Board – that VFMS is District property and that they can do what they want with it. Unlike the fencing at the other District schools, the fencing at VFMS is unique – the property consists of two parcels with different zoning and a legal agreement with the adjacent community. The 2002 Special Exception by the Zoning Hearing Board set the parameters for TESD with Chesterbrook Civic Association and Green Hills Association – it would seem that any changes to that agreement would require review and updating. This ‘new’ plan from the District does have the fencing out of the backyards of the abutters and moves the 6-foot fencing to behind the fields. (This will be the first 6-foot fencing at any of the eight schools.) However, the fencing will run the length of Valley Forge Road in front of the VFMS and into the woods that is shared with Green Hills. Rather than ending the fencing at the woods, the fencing goes through the woods and will turn into the Chesterbrook community. I asked if the District intended to take trees down in the woods – the response was no, that the fence would zig zag around the trees! To be clear, the zig-zagging of the fencing will abruptly stop at the end of the woods at an abutter’s property line. The fence will not connect to another section of fencing … the “fence to nowhere”. 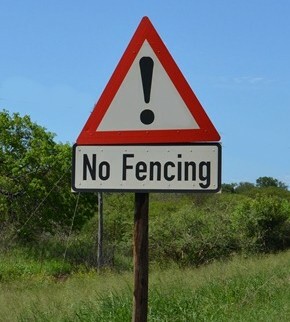 If the handful of audience members who attended the Facilities Committee meeting are to believe what was stated – no further discussion is required with the township on the VFMS fencing, no approvals are required, no amendment to the 2002 Special Exception is needed. When asked if this decision to change the plans required a full TE School Board approval, the answer again was no. In other words, the District can do whatever it wants at VFMS because the agreement was meaningless and implies that there are no deed-restrictions on the property. Tonight the District has a Finance Meeting (6:30 PM) and a Budget Workshop (7:30 PM) at Conestoga High School. Click here for the agenda. Although the outsourcing vendors for the District’s aides and paras was on the last Finance Meeting a and the last School Board Meeting agendas, it does not appear on tonight’s agenda. How are the 73 full-time aides and paras supposed to make a decision by May 1 on whether to go part-time (to remain a District employee) or go with an outsourcing company when they don’t know who the outsourcing company is or the benefits … ? The legal bills to the taxpayers continue to mount because of the TE School Board’s fencing decision at Valley Forge Middle School. Last week, residents of Green Hills in Chesterbrook sought a compromise at a meeting with members of the District’s Facilities Committee, (Pete Motel, Liz Mercogliano, Kevin Buraks and SB President Kris Graham), Art McDonnell, Dr. Gusick, attorney David Falcone of Saul Ewing, Tom Daley of Daley & Jalboot Architects and the District attorney Ken Roos, regarding the planned 6-ft. chain link fencing. In addition to the homeowners, attorney Brian Nagle of MacElree & Harvey represented Chesterbrook Civic Association and Michael Gill of Buckley, Brion, McGuire & Morris represented Green Hills Homeowners Association at the meeting. The meeting ended with no compromise to the proposed 6-foot chain link fencing. Agreeing that proposed fencing violates the terms of the 2002 agreement with the Chesterbrook Civic Association, attorneys Nagle and Gill filed official Complaint letters with Tredyffrin Township yesterday on behalf of their respective clients. The letters were sent to Tredyffrin Township’s solicitor Vince Donohue with copies to the Board of Supervisors and Township Manager. (Click here to read Nagle’s letter; click here to read Gill’s letter). With this official Complaint letter, the School Board, under the leadership of Kris Graham, has caused additional costs to the taxpayers to defend their proposed Valley Forge Middle School fencing project. 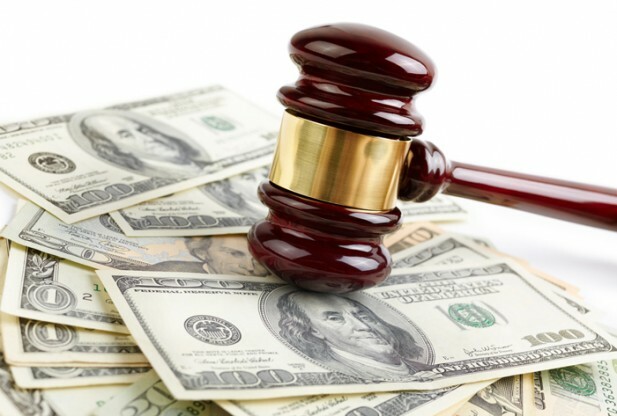 In addition to paying legal fees to the District’s attorney Ken Roos and to Saul Ewing attorney David Falcone, taxpayers can now add the legal fees of Tredyffrin Township solicitor Vince Donohue to the cost of fencing at VFMS. Plus, the TESD taxpayers of Green Hills in Chesterbrook must pay the legal costs of Nagle and Gill. Here’s my question to the members of the TE School Board – when is this going to end? This isn’t YOUR money that you are using to defend your decisions, it’s OUR money – it’s the taxpayer’s money. School Board, how many thousands more taxpayer dollars are you going to spend on legal defense of your decision? Kris Graham, as President of the School Board, we challenge you to lead!